Rising to prominence in the 1300’s as the seat of the Kingdom of Lane Xang (Kingdom of a Million Elephants) the town of Luang Prabang lies nestled in the mountain ranges in northern Laos on the banks of the Mekong River. As with the rest of Laos, Luang Prabang suffered through sixty years of civil war and from devastating strife spilling over from the Vietnam War. In the years since its designation as a UNESCO World Heritage site in 1995, this remarkable town has rapidly emerged from long years of isolation. Perhaps the most cohesive element in the Lao peoples’ resilience and survival is the deeply entrenched Buddhism of the nation. 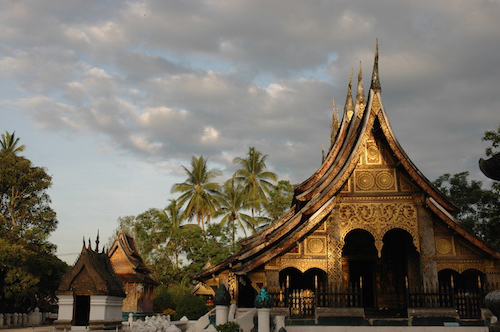 Nowhere is this truer than in Luang Prabang, with its unique blend of material and immaterial cultural practices; and it is here where the Buddhist Heritage Project works to develop all segments of the society in a meaningful and sustainable manner. Luang Prabang is among the most intriguing towns in the world, with its unique culture, infused by centuries of Buddhist traditions, and the striking natural beauty of the rivers, mountains and forests. Mere words cannot do justice to Luang Prabang. 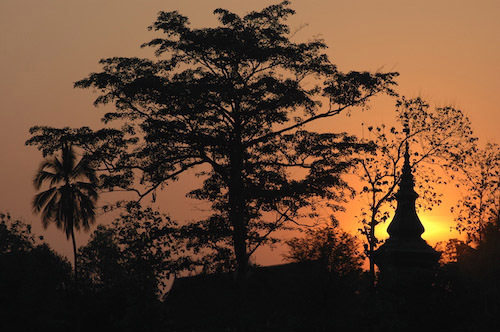 Please browse through these photographs which speak more eloquently; better yet, visit Luang Prabang and be enchanted! And bathes the ancient Vat Xiang Thong in a golden glow. 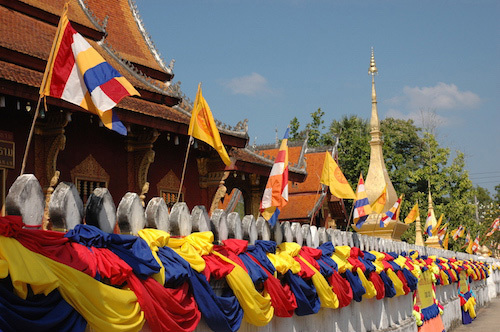 Vat Saen Soukhaham, on the Peninsula of Luang Prabang, is alive with decorations in preparation for a coming festival. 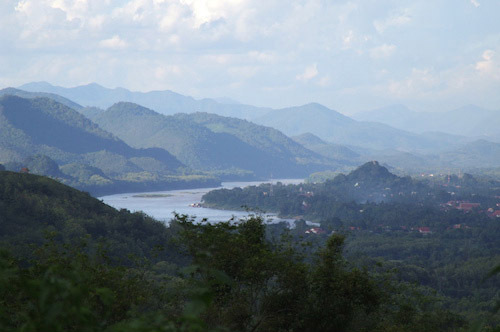 Viewed from a mountain top and looking north, Luang Prabang seems to float as it nestles in the embrace of the Mekong River and the surrounding mountain landscape. 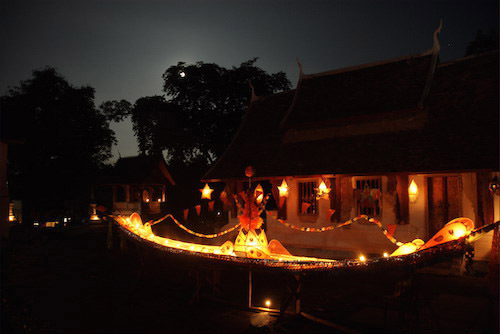 In celebration of Ock Pansaa, the end of Buddhist Lent, a Temple glows with an illuminated fire-boat and glittering paper stars. 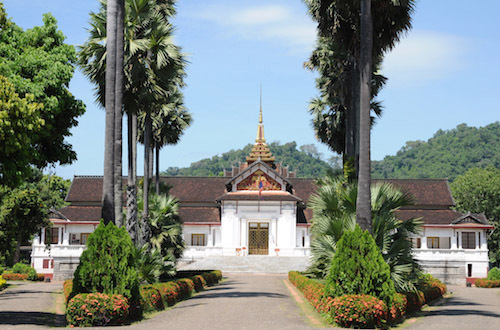 The former royal palace, and now the National Museum of Luang Prabang, stands proudly in the centre of the town. At Vat Suvannakhili novies clean around the Sim, or Chapel, in preparation for a fresh coat of paint to welcome the coming Buddhist New Year celebrations. 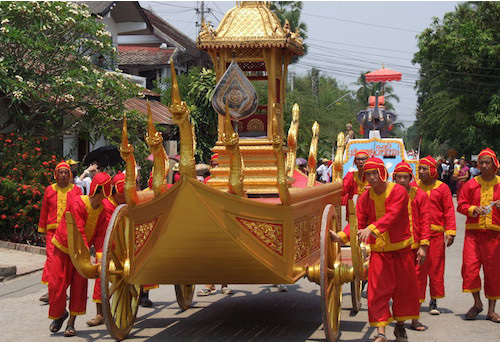 A spectacular parade carrying the statue of the Prabang marks the highlight of the Buddhist (and Loa) New Year Festival in April. Thousands of people line the street between Vat Mai in the centre of town and Vat Kiang Thong. The revered abbott Pha Khamchan Virachittha Maha Thela passed away in 2007. 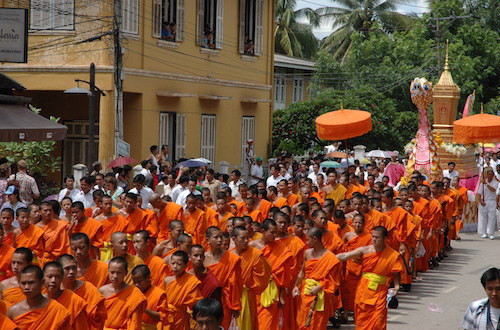 During the funeral procession thousands of monks and novices and tens of thousands of the faithful lead the casket to the cremation ceremony. 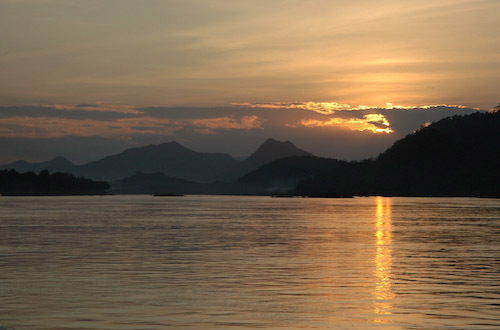 Accross the Mekong River from Luang Prabang, a blazing sunset shimmers on the water's surface, highlighting the stunning natural beauty of the town and it's environment.